What a Way to Kick Off USD Dakota Days! Arguably one of the most anticipated campus events, Dakota Days is a week-long festival showcasing the University of South Dakota’s school spirit and athletics. Many of the events will be held in USD’s DakotaDome, located at 1101 North Dakota Street in Vermillion, South Dakota. Originally constructed in 1979, the University’s Board of Regents recently approved a $26.3 million renovation of the multi-sport venue. The Fiegen Construction team is proud to be involved with this project and are eager to begin interior renovations which are slated to begin in February 2019. Funding for the renovation project came from three sources; the USD Foundation, USD capital funds and South Dakota’s Higher Education Facility Funds. 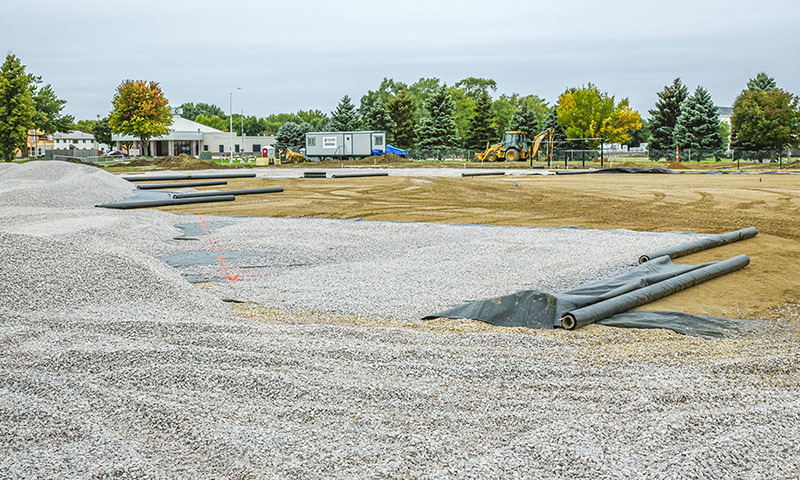 The project has already commenced with the construction of the football team’s new outdoor turf practice fields (pictured below), which are located to the west of the Dome. Though USD is moving away from natural grass playing fields, there are benefits to utilizing artificial turf. Not only will the turf fields drain more efficiently, but the team will have more on-field time preparing them for conference games. 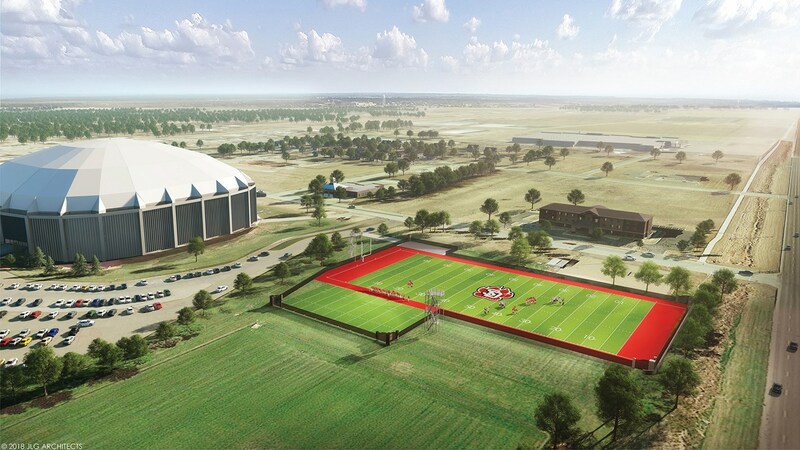 The remaining renovations will be completed in multiple phases, starting with a 100,000-square-foot interior remodel and site improvements to the west side of the DakotaDome. Upgrades to the interior will include new football locker rooms accommodating 110 athletes, as well as a club and loge suite level, an additional 3,500 stadium seats, redesigned concourse level complete with restrooms and concession stands, and new administrative office spaces. Mechanical and electrical framework, fire safety and plumbing, as well as modernizing the lighting throughout the DakotaDome would also be addressed. Additional work will involve the mezzanine level positioned behind the student section, adding restrooms, concession stands and public entrances. The DakotaDome has seen several renovations during its 40-year history. Originally built with an air-supported dome, a steel roof was installed in its place in 2001 to address previous issues. In 2007, new locker and training rooms were renovated and the main floor was replaced. Finally, new turf was installed on the main field in 2013. The upcoming renovations are due in part to the recent construction of the adjacent Sanford Coyote Sports Center (SCSC). Many of the administrative offices, locker rooms, and equipment storage were moved to SCSC, leaving room for improvements in the Dome. To accelerate the construction schedule, precast structural concrete components will be used. Anticipated project challenges include the installation of these precast columns, beams, rakers, and stadia under the existing dome, envelope and floor structures. In addition to being the home of USD’s football program, the DakotaDome also hosts local graduation ceremonies, track meets, youth football games and the South Dakota state high school football championships. “Our company founder, Ron Fiegen, was the original low steel erection bid back in 1979, however, during value engineering the original steel structure was replaced with the fabric roof. It’s very exciting to come full circle now with this project and to play a major role in this substantial renovation of the Dome,” says Fiegen Construction President Jeff Fiegen. The scope and size of this project required extensive architectural and engineering design. 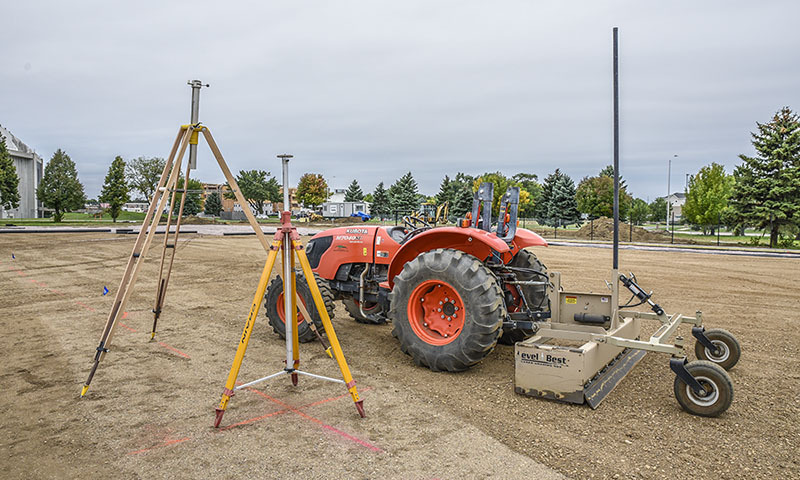 Thanks to the expertise of Fiegen Project Superintendent Denny Millar, Fiegen Project Manager Jarrett Hallvin, as well as JLG Architects, West Plains Engineering, Sayre Associates, and Rise Structural Associates, Inc., we look forward to the completion of the renovations in August 2020.